Since 1997, Web industry professionals have used the WebAward competition as a way to promote themselves, their companies and their best website work to the outside world. Here, you will find a sample of some of the ways WebAward winners have promoted their website awards to clients, the media and internally. At the bottom of this page you will see quotes from participants of past WebAward competitions telling you in their own words how they have benefited from their award winning website. Many sites use online award pages to highlight their WebAward. Here are some examples of how past web site award winners promote their awards on their sites. Many award winning web sites also use offline marketing to support their award winning internet marketing efforts. Here are some examples of how some companies merged online marketing with traditional marketing efforts. 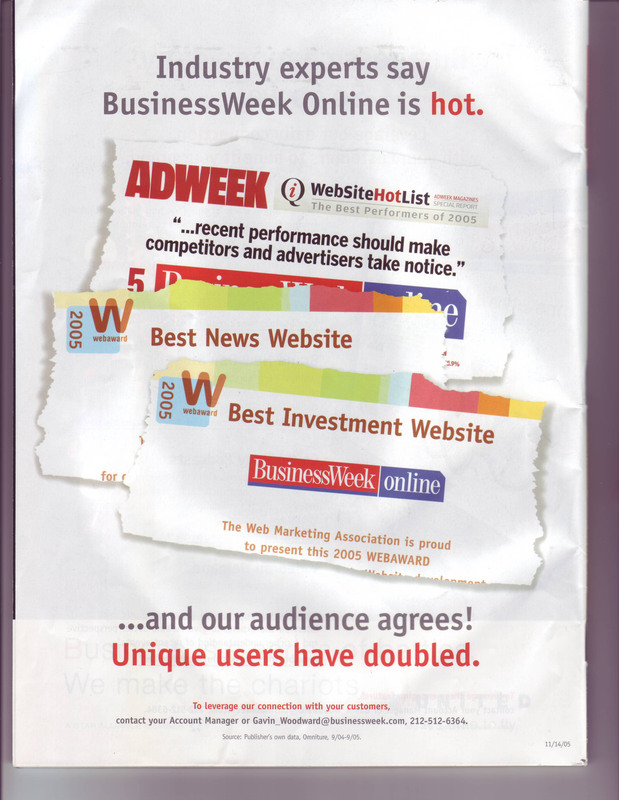 BusinessWeek used their Best News Website and Best Investment Website WebAwards as part of a full page back cover ad. 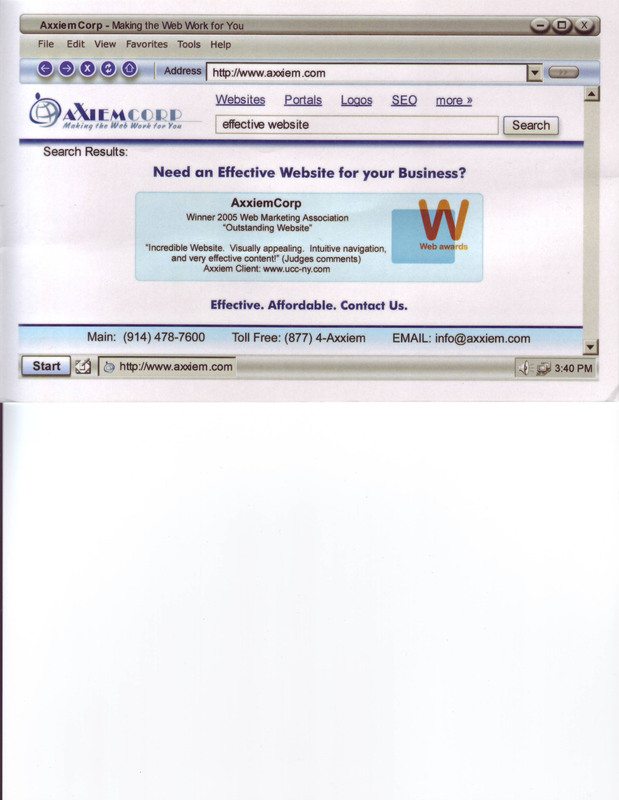 AxxiemCorp used their Outstanding Website WebAward as the subject of a postcard sent to perspective clients. 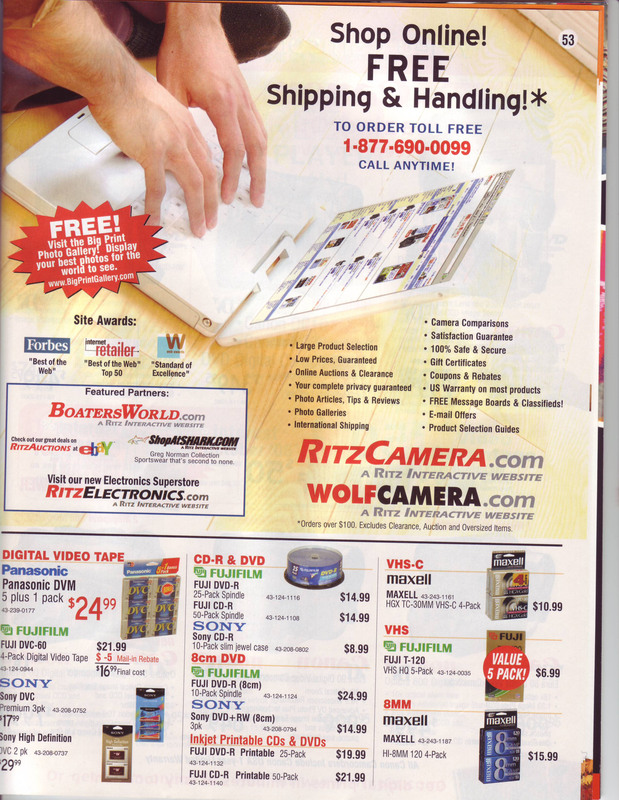 Ritz Interactive used their Standard of Excellence WebAward in their print catalog on a page to promote their website. Valerie Petrone presents a WebAward for dodgers.com at a Los Angeles Dodgers game. Each year we also receive significant press coverage of the WebAwards. Here are a few samples of the press coverage. W3Reports: News for Webmasters - Who has the best advertising Web site? "Winning a WebAward has been a great sales tool for our company." "When we win a WebAward, it not only makes our firm look very professional, but greatly impresses the client who won the award!" "My company is able to promote the WebAward as a non-biased recognition of the hard work done by the entire marketing team." "The WebAward competition is a wonderful way to gauge the quality of our websites against not only our industry, but the broader internet community." "We have an extremely small team working on our sites and an even smaller budget, so the WebAwards helps to validate our contribution to the company and builds morale within the team." " It was a honor to be recognized by esteemed colleagues and a nice perk to add to our award resume." "We gained immediate recognition from having won an international competition. Our clients seemed to be more alert to our offerings." "WebAwards have helped Atomic Fusion to effectively showcase its interactive marketing expertise to our client and prospects." "I gave my client (CEO of the company) the award plaque. He was so excited about the award that he sent out an e-announcement to his collegues. The story then got published as the key headline in a high profile industry newsletter. We got our names in front of this whole industry with a high endorsement from our client. The award spoke for itself. Thank you!" "I wanted to commend you guys for a great competition!" Robin Naughton, World Wide Design, Inc.
"Winning a WebAward provides feedback for success and importance of current programs and helps maintain our funding." "The awards themselves allow us the opportunity to show our prospective clients the quality of work we provide." "The WebAward competition gives us, and our clients, the opportunity to gauge how our sites compare to others in the industry." "The feedback from the judges is unique and provides a sense of where we score compared to the competition." "The WebAward did lend credibility and prestige to our organization. It is a validation of the work we are doing." "Multiple recognition in the WebAwards brought prestige to not only my firm, but measurable results for my clients." "When we present to new clients, we're able to include the WebAward in the list of awards that we've won." "Our WebAward reaffirms that our work not only meets our client's needs, but is also above and beyond industry standards." "The industry benchmarking, feedback and depth of evaluation criteria has inspired our web development team to continuously upgrade Russell.com." "Our company has gained insight into our site that we'd never considered in the past." "It was good to see the quality of the entries. Thank you for the opportunity to enter." "Winning awards from Webawards is very important achievement in online media. The press, Internet communities and blogs increased our visibility." "We have used WebAward exclusively to shift our clients thinking about what we can do for them." Anthony Iezzi, Director Creative, iezzi. "Being a traditional agency, WebAward has provided an opportunity for us to showcase our skill set on the web." "It's a long, hard journey in any start-up, so to get both some recognition and valuable in-depth feedback was worth the entry price ten-fold. Thank you, WebAwards!" "Entering the WebAwards is always a pleasure, because you make the process so easy! Keep up the great work!" 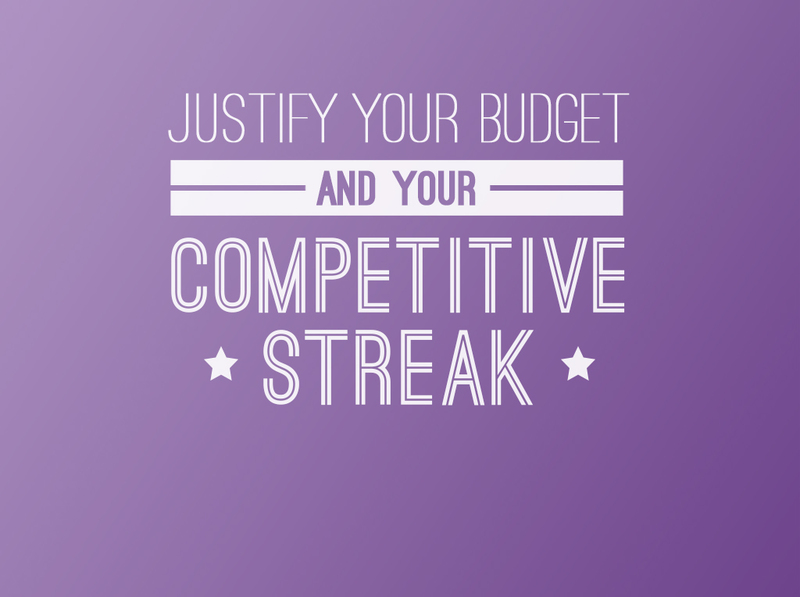 "The WebAwards levels the playing field for smaller design agencies by providing an opportunity to compete head-to-head with the goliath agencies through objective evaluation utilizing strict criteria for site design and development"
"Even though we didn't win anything, we used the comments from the judges to help improve our Web site." "The judges comments allowed me to deepen my relationships with my clients, bringing us more work, as we were able to address key points and insights raised by these experts: Thank You WebAwards!" "Being able to market the site as award-winning is helpful, and presenting news of the award to senior management helps increase the department's and Web site's credibility."